UK hotel chain easyHotel is offering a new ‘Pupgrade’ service to enable guests to bring their pets with them for an additional £10 per night. The move comes in response to London’s increasing obsession with ‘Social Petworking’, with a rising number of small dogs accompanying their owners on business trips. To assist dog owners that can’t bear to leave their pets behind, easyHotel is trialling a new deluxe ‘pupgrade’ service for pets. 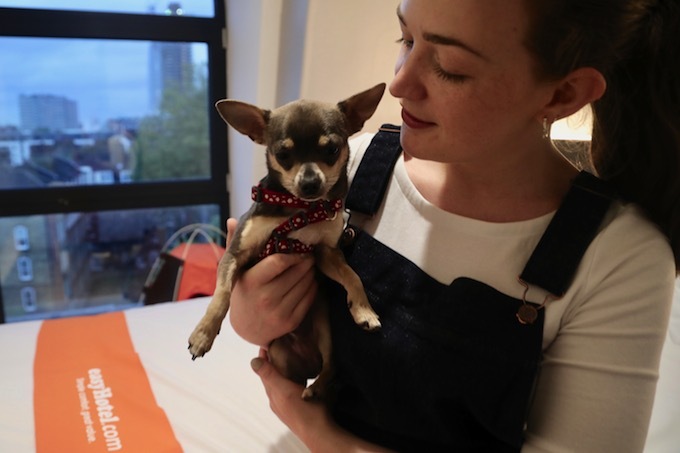 For an additional charge, guests at easyHotel in Old Street can request an orange ‘pet yurt’, an orange ‘chewvet’, a bone on arrival and a small ‘Minibark’ fridge stocked with gourmet pet snacks and drinks. Snack options on the menu include treats developed by Michel Roux and a bottle of ‘Pawsecco’, a non-alcoholic dog food jus that can be poured over a dish. Small dogs are becoming a fixture in offices and coffee shops throughout the capital, with particularly high concentrations in the tech and marketing communities of Shoreditch. Studies indicate that dogs can have a positive effect on productivity and lower the stress levels of employees. A 2010 study by Central Michigan University found that having a dog in the office improved collaboration. Another study from the Virginia Commonwealth University School of Business, found that animals in the workplace make work feel more satisfying. easyHotel’s network of locations has grown significantly this year, as has demand from business customers, with new hotels opening in Birmingham, Manchester and Liverpool. Further openings are scheduled for the next 12 months. Rodriguez added: “Our hotels offer our guests comfortable, stylish accommodation in the heart of many of Britain’s favourite cities at incredible prices, often for less than the price of pillow.